Google Analytics offers a wealth of information which sometimes seems like too much to digest. I’ll provide some tips and tricks to get the most value out of your reports. After you understand your reports, you’ll be in a much better position to make decisions about many aspects of your site (images, ads, prices, workflow etc…). Pageviews – You can think of this as hits, or impressions. It’s is essentially meant to tell you how many times a set of eyeballs has viewed the pages on your site. Since many/most people visit multiple pages during their visit to your site, the pageviews is the highest number of the big three. If you offer advertising on your web site, your advertisers might want to know your pageviews (monthly). If you are looking at a yearly report of your pageviews, simply divide by 12 to get your average monthly pageviews. 120,000 pageviews divided by 12 months equals a monthly average pageviews of 10,000. Visits – This number essentially tells you how many times a visitor has come to your your site- it does not reflect how many pages they view. This number is usually lower than your pageviews. If a visitor comes to your web site today, and views 4 pages, and then leaves, and then comes back and views 5 more pages, he/she counts as 2 visits. Unique Visitors – This number attempts to eliminate the repeat visits within a short period. It counts them as repeats, and thus not unique. This is usually the lowest number of the big three. (direct) / none indicates a visit where the user did not use another web site to get to your site. In other words, they typed in your URL, or they make have it bookmarked. Google / organic indicates that the user searched Google and then clicked on the link from Google to your site. Organic is just another way to say it’s from legitimate search, not from a paid ad or link. m.facebook.com / referral indicates the person clicked on a link to your site, from Facebook. The m before the Facebook.com just indicates it came form a mobile device. Mobile traffic is more important to sites that also have a bricks and mortar location and otherwise rely on customers in a certain location. This is a list of your most popular pages. Note, a site’s home page is often indicated by a simple / or it may contain the word index as in index.html. So what does one do with this information you might ask. Here are some examples. You might want to test the effectiveness of your campaigns… so you create a Facebook ad and send those links to one page of your site, and you create an e-news and send those links to another. 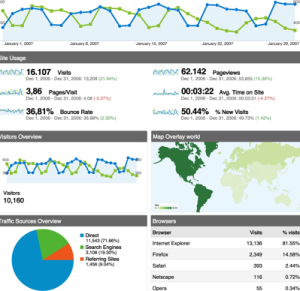 Google analytics will tell you which resulted in more visits to your site. If your business is nationwide, you can use Google Analytics to see which States or regions responded best to your campaign. If you are using Google Adwords, you should absolutely link your adwords and analytics accounts. If you do your ads will be auto-tagged and tracked.